Turn back the clock a few centuries, to the time of knights and castles! Build sturdy bridges to supply your city with provisions. Construct bridges that collapse under the weight of attacking troops and send the horde of enemies into the abyss below! Protect your foot soldiers and your horse-drawn carriages with covered bridges and stable pillar structures. There are a total of five materials available to help you build the perfect bridge: wood, heavy wood, stone and ropes, along with the new addition to the bridge roof. Discover an exciting background story and familiarize yourself with various materials on a step-by-step basis. Learn everything you need to know so that your bridges meet the requirements of the different levels. Veterans – try your hands at new game modes. Beware the unique bonus challenges will leave even the most experienced players at their wit’s end! 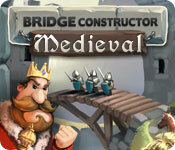 BRIDGE CONSTRUCTOR: Medieval is rated 2.2 out of 5 by 13. Rated 5 out of 5 by khixan from Ready for a challenge? I can't believe anyone gave this game a 1 star review. It was GREAT! It is challenging. I actually broke down and went and found a walkthrough for one level that had me stumped. I played this game for hours on end trying out different ideas and solutions even after I'd beaten it. If you loved the Cargo Bridge games, you will love this too. Happy gaming! Rated 5 out of 5 by Janette5 from This is not a one star game. 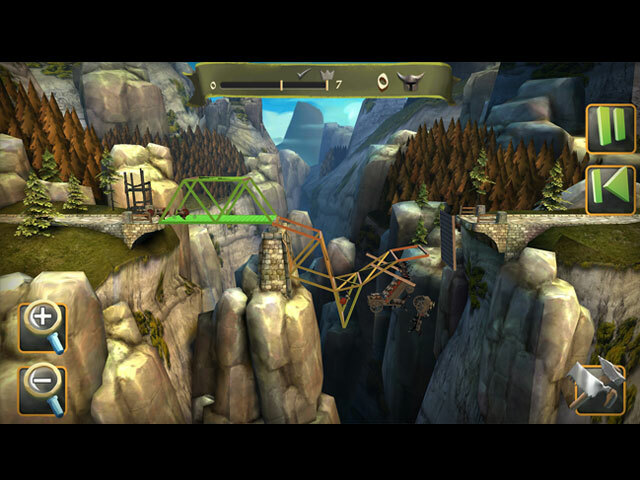 This is a technically challenging puzzle game. 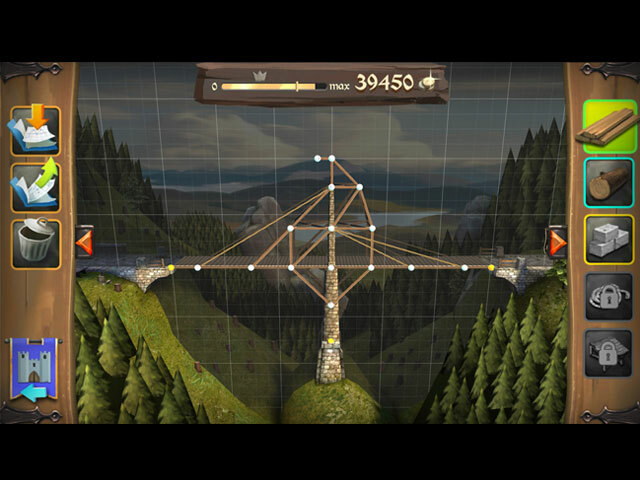 You have to construct bridges using planks, wooden poles, stone, ropes and roofing. The challenging part is that you have to construct it using certain configurations of those items and within a budget constraint and to transport wagons of a certain weight. If you enjoy that kind of thing this game will give you hours of challenge trying to figure it out. I'm thoroughly entertained by it. In the process you learn about the strength of triangles and to support your structure so that they don't collapse. There are tutorials that pop up at the start of many levels that teach you the basics. Further there are solutions and guides available on the internet. If you were someone who liked to play with toys where you build things or projects where you figure things out, or logic puzzles then this game will appeal to you and I would recommend you give it a try. Rated 4 out of 5 by shinsudragon from Challenging Construction Never putting in a review on any type of games, this one I had to. It is very challenging, makes you think where the next board goes. Yes, it can be frustrating, maybe boring to some, But as a mom, my kids were helping right along side...LOL Which was great for them to use their minds. Rated 3 out of 5 by LunaNik from Same issues as Playground: inadequate tutorial and awkward game mechanics. Improvements in Medieval over Playground: more detailed graphics, a storyline to provide context. However, I had the same issues with this episode. I found the tutorial sadly lacking. No information was provided about material cost and structural specs. And the game mechanics were awkward. Also, it was impossible to find the balance point between coming in under budget AND not exceeding weight tolerances. If you built on the cheap, you exceeded the weight tolerance. If you spent money, you stayed with the weight tolerances, but not within the budget. There must be a microscopic sweet spot between the two, but I couldn't find it. Recommend you try the demo. Rated 2 out of 5 by sabinesa from interesting idea, but not enough for good game This sounded so intriguing, except it's boring right from the start. I mean these type of games have been around a long time and mostly it's some science theme where one ends up building all sorts to make a ball fall through a hoop or the cat get the mouse or whatever. What they all have in common is for one a speed-up button - not this bridge building thingy, though.One has to sit and wait for all the riders and horses to get across the bridges - first 2 times that was cute, then it got boring quickly. Also, already in the tutorial type levels the goals where not achieved when doing as told by the teacher -> duh?? Overall, the same thing over and over and over, that I was indeed over it after trying for 30 minutes ;( The devs should try out the over 10 year old series TIM (The Incredible Machine) to see how something like this should be done. 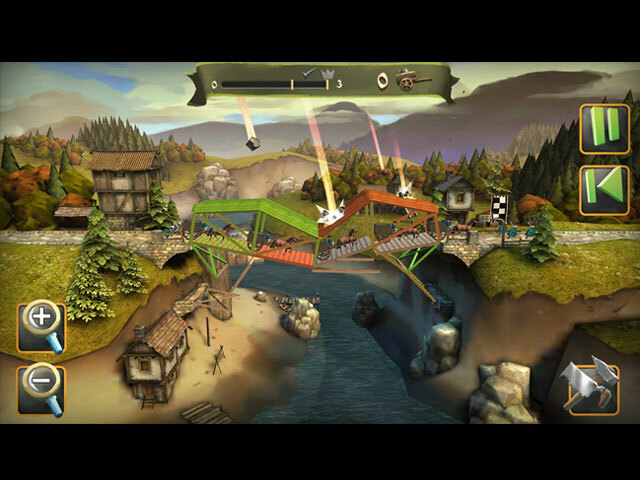 Rated 2 out of 5 by BettyBaloo from Bridge building that leaves you feeling meh I've seen this type of game before and although it won't change the world I thought it might stretch my brain and pass some time so I downloaded the trial. Not sure if I'm the world's worst bridge builder or if it's nigh on impossible to build a stable enough bridge within the lower budget to get the crown. It's a challenge to just build a bridge that won't fall down. There's a tutorial introduction to most levels but they don't seem to be relevant to the next bridge you have to build. EG roof tutorial leads onto a level where the roof option is greyed out so you can't build one. A roof was available for the previous level and was needed but it was only by trial and error that I used it. Given that you only have a finite budget anyway some bridges are impossible to build. The tutorial says you can always ask for a hint and helpfully highlighted a button I didn't have and so I couldn't get help even when I wanted it. This could have been a good game but wasn't. A combination of impossible tasks and what seem like glitches, it's an exercise in frustration. I won't be getting this game even with a credit. Rated 1 out of 5 by pennmom36 from Looks Like There Will Be No Delivery To The Castle Today The graphics are really good, the music is certainly medieval, but, those are the only positive things I can say about this game! You are tasked with rebuilding bridges leading to the castle, that have been damaged during an invasion by the Urcks. Each level requires you to build a bridge that will withstand the particular delivery load (fish vs building materials) and you must build this bridge at or below a certain budget. The problem is, it's impossible to build a bridge within the budget! I replayed several levels multiple times, using the cheapest methods, combining cheap and expensive, almost every imaginable way, and still came in over budget! The materials used are stone for pillars, large wooden planks, regular wood, rope etc. some building materials are more expensive than others, but longer bridges require materials that can support the overall length. When you think the bridge is road worthy, you click on the play button which summons a wagon convoy that will hopefully make it all the way across the bridge. Even if you're an autocad aficionado, I think you'd become bored with this game. Rated 1 out of 5 by PetraElster from Unplayable The game could be great, but it has clumsy controls that make the game unplayable. Unclicking the tools is a chore. The screen does not roll back and forth easily. Switching between erasing and placing objects is cumbersome. And most of all, there is no way to adjust the language. It is totally uncool to assume that just because someone is not currently living in the US, that the person does not speak english. I was very dissapointed. Rated 1 out of 5 by Dulcera from Waste of Time This game is impossible to do. I did have a tutorial, but when I did exactly what it told me to do in level 1, I went over the amount I was allowed to spend!!! Ridiculous. Rated 1 out of 5 by Passyloon from Quality Tested??? I love strategy games and was pleased to see a new one. This one is hopeless however. No real instructions. The tutorial was just knocking down a bridge when the object is to build one. I thought I must be missing a clue, but there was nothing. I couldn't get past the first usually blazingly simple easy level. First time I have dumped a game after 5 minutes. BF claims their games are quality tested. Maybe this is a quality that is only good for coders who make things work. There's a challenge. First time reviewer, but this was so awful I had to.